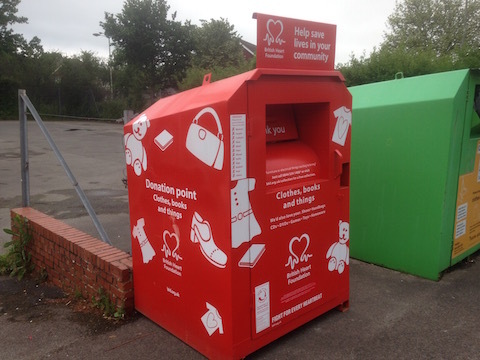 Look for red metal bins and donate unwanted items to The British Heart Foundation | Joining In! Red metal bins have again been placed in stragetic parts of Guildford in which residents and students can deposit unwanted items of clothing, paired shoes, books, DVDs, kitchenware and small electrical items. 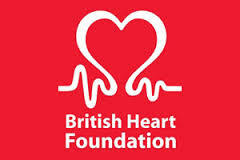 The British Heart Foundation red collection bank at the Park Barn Community Centre in Cabell Road. Donations will generate vital stock for the British Heart Foundation (BHF) and all money raised will help its life-saving research into heart disease. The bins, that will be in place until the end of July, are part of the BHF’s Pack for Good campaign and their placing has been made possible with the help of Guildford Borough Council and the University of Surrey. People are advised to put items in a tied plastic bag (no sharp knives or duvets) before depositing them. Special BHF plastic bags are available from the borough’s community wardens based at the Park Barn Social Centre off Park Barn Drive, and also at the University of Surrey. The collection banks are now sited at: Hazel Avenue, Bellfields; the corner of Chapelhouse Close, Park Barn; Guildford Park Avenue; Guildford Park car park; Hazel Farm, Pitch Place; the Park Barn Community Centre in Cabell Road; and in the car park of the Royal British Legion, Northway. Karen O’Donoghue, national stock generation manager at the BHF, said: “We’re thrilled to be working alongside Guildford Borough Council and the University of Surrey in the Pack For Good campaign once again. For more information about Pack For Good to locate your nearest BHF shop visit bhf.org.uk/shops or call 01483 505050.